Developer Tom Happ gives us a solid "maybe"
Axiom Verge is one of the best Metroid-style games we've seen in a long time, and we already know that Nintendo is super-keen to get the game onto its consoles. 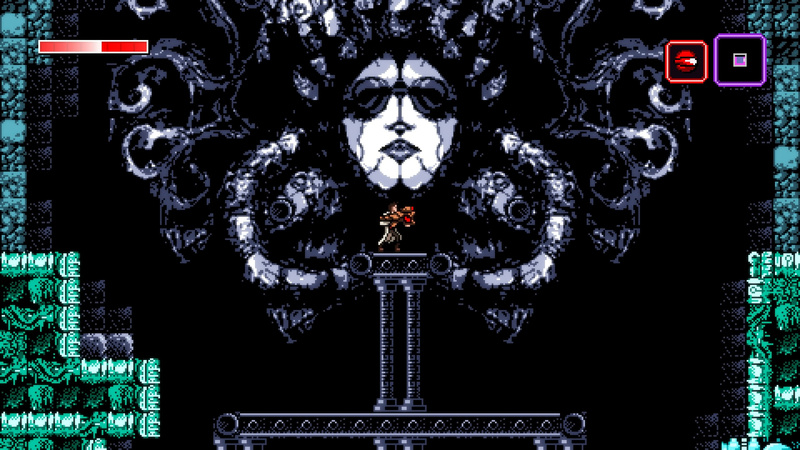 ...can't commit to anything, but Axiom Verge will *probably* be available for Wii U in 2016. 3DS is quite a bit more difficult since the hardware is so completely different. Should Nintendo be reading this and decide to lend me a hand, that'd be VERY appreciated!! Nintendo - give this man some help. We need Axiom Verge on our consoles! It's funny this article is here as I wake up this morning. I JUST, this weekend, decided to finally just go ahead and buy it for PS4. It's an amazing game indeed. As a HUGE fan of Blaster Master and Metroid, this is the best thing to happen since them. I hope this comes to Wii U for everyone who hasn't played it yet! Hope it's coming out on Vita soon. Yes, please, make it happen. I would love if somehow this could come to the 3ds. I was hoping Nintendo would give me a 2d metroid, but since that didn't happen I just want to believe they will help bring this game to both of their systems. The cause for concern has arrived. It looks like Metroid, but then I look at the main character and I find myself missing Samus. Oh, Nintendo, how I loath you right now. Considering we won't be seeing any new Metroid games for at least 3 years, more if you consider they don't even have a team or resources for one yet, it seems that this maybe the best title to fill that hole. I just want to know what Retro Studios are doing with themselves the past 18 months? Nintendo will probably thumb their nose and make a new Amiibo based Metroid instead. Axiom is an excellent looking game. @FragRed Let me remind you that all the facts you mentioned only refer to things Tanabe mentioned regarding Metroid Prime. There could still be a Metroid game in development right now under Sakamoto, so all hope is not lost. Nintendo itself even begs for a Metroid style game, the irony of it all. Some websites say it's already out... But it says TBA on Metacritic. I'm having this problem with Bastion too, have you checked for it in the Playstation store? @-Godot It's only out on PS4 right now. That would be great, absolutely. Yeah Nintendo, you heard the man. Since you can't give us Metroid, how about letting this guy do the job for you? @manu0 @FragRed Also keep in mind, that Tanabe only said IF they would starting right now, the game wouldn't be on Wii U. That doesn't mean they aren't already working on it. So, is it worth waiting a year for when I can get it on Steam right now? And if I wait a year, is it worth buying at full price on the Wii U when I could have bought it on sale on PC at some point between now and then? Unfortunately, this is the conundrum I face with almost every indie on the Wii U, and the reason I buy most of them on PC. Axiom Verge: Federation Force is definitely coming though! Pretty much the only way I would play this game is if it comes to Wii U so bring the game and I will bring my wallet! @scamander Youre mistaken. He said that he couldnt get a team together to make a metroid on wii u. This was mentioned after his response that it would take 3 years to make a metroid game on wii u. In other words, itll take three years, and the reason it has not been started is because he couldnt get a team together to make it. Go read the original conversation. Awesome. I'll definitely pick this up for Wii U if/when it comes out next year. I have a really strong feeling it will since the developer seems committed to bringing to at least one Nintendo platform. Hopefully. Tom Happ has given Metroid more love with this game than Nintendo has in almost a decade. Nice game. Release Date: May 14, 2015 on steam. So why bother? This and Freedom Force are currently holdouts on steam, but I'd rather have them on Wii-U. As long as "A" button is to jump and "B" is to shoot, then this thing can take a year to hit the 3DS and I'll be satisfied. That moment when the closest thing you have to a real Metroid game on a Nintendo platform is a port of a PS4 game. @ikki5 "Might" suggests even further that NX is coming next year. @hobthebob Even then that is not necessarily the truth. They have a history of lying about stuff that just hasn't been announced yet. Well, I'll just go ahead and hold off on breathing for awhile. It's amazing how many MetroidVania games are out there. Matter of fact, the only game of this genre that's not a MetroidVania, is... well... Metroid.